If you've known me long enough, and as I've stated here before, I'm a big ol' geek. And like any proud geek, I love my superheroes, especially the Marvel-ous ones. See what I did there? Uhh.. anyway, when I saw online that The Face Shop was releasing a Marvel collection, I promptly screamed, maybe cried a little, and desperately tried to find out if it would be released here too. I nearly died was super giddy when my contact at TFS reassured me it would be and they'd even be sending me a few things from the collection. Of course, my greed was too great and aside from what they sent, I also purchased a bunch of other items because MARVEL, guys! 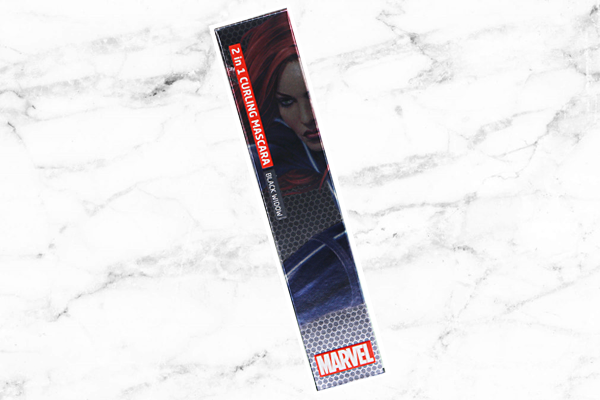 First one up for review is the 2 in 1 Curling Mascara in Black Widow. The Face Shop says... 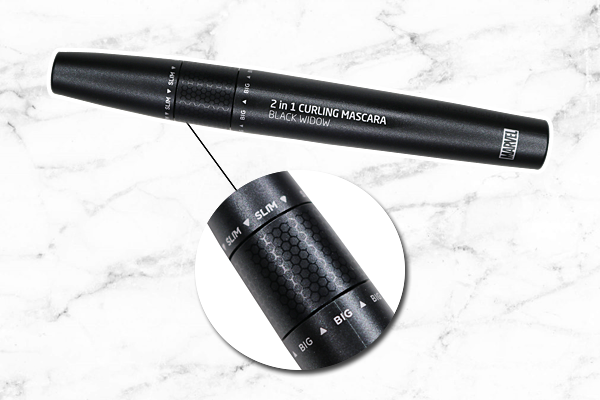 The innovative 2-in-1 brush provides 24-hour curl by defining each lash, even hard to reach lashes. Achieve ultimate curl, even on hard to reach lashes. Experience ultimate curl from root to tip, even in hard to reach lashes (3.5mm from the inner and outer corners of your eyes) and bottom lashes. The NEW 2-in-1 brushes go great together to achieve ultimate curl. Big brush: The roll brush is designated to create powerful curl. Slim brush: The soft, fine slim brush is designed to curl each and every lash. The combination of Balloon Powder, which prevents lashes from drooping, and lash fixer helps create 24-hour curl. The mascara comes in a sleek, black tube. The details I love about it are the Marvel logo at the bottom and the hexagonal pattern near the top that mimics many of the recent Marvel superhero suits. One other unique feature is that this mascara actually comes with two brushes. You can 'access' the slim brush by unscrewing the cap that's above the hexagonal pattern and the big brush by unscrewing the cap under the pattern. It's pretty nifty! 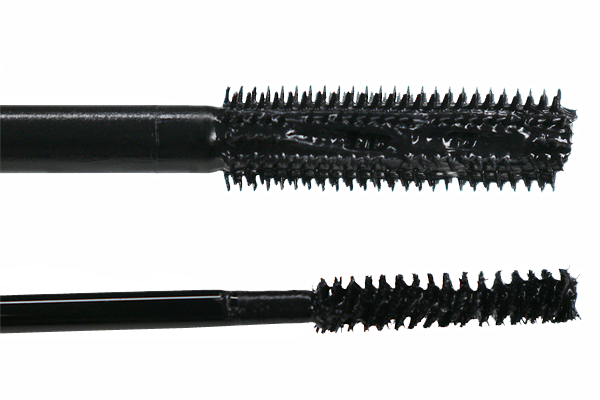 Even though the top brush is referred to as 'big', it's actually not that much bigger than a typical mascara brush. It's only big compared to the slim one, obviously. It also has plastic bristles which I like most when it comes to mascara applicators. I'm a big fan of the slim brush too since it's perfect for bottom lashes and getting at those inner lashes. No more accidentally getting mascara underneath my eyes! Unfortunately, while the mascara makes my lashes appear to have a bit more volume, that's about all it does. I don't see that much lengthening, plus the formula sometimes make my lashes stick together like you can see in the last pic on the left. It also gives a spidery effect to both my top and bottom lashes if I go for two coats, so I stick to just one. The so called 'Balloon Powder' didn't do much to keep my lashes from drooping either as halfway through the day they're definitely not as 'lifted' anymore. So far, Maybelline's Great Lash is the only mascara that keeps my lashes from drooping the entire day. Overall, if you're looking for a decent mascara that promises (some) volume more than length, this might be worth a try. Plus, if you have short and small lashes, the slim brush would be great for them. I know a lot of people with lashes like that tend to complain about how applying mascara with just regular-sized brushes can be difficult sometimes. They just end up with mascara all over their eyelid or undereye area. If you're Marvel fan, I know formula be damned because like me, you'd probably buy this for the packaging alone!